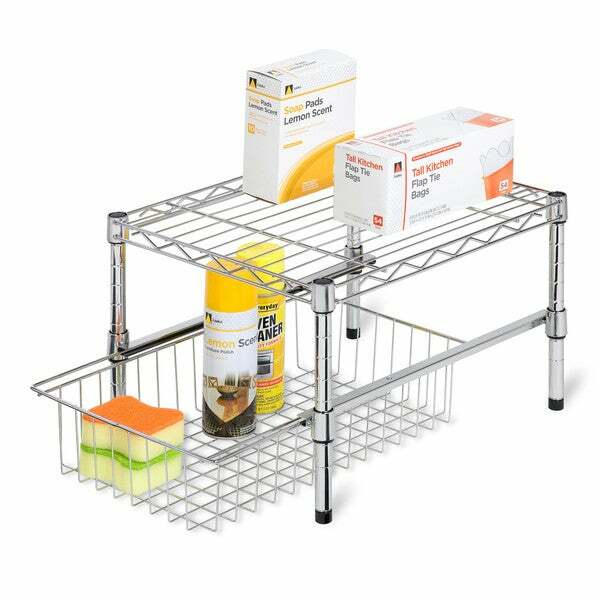 Honey-Can-Do SHF-01867 Adjustable Shelf with Basket Cabinet Organizer, Chrome. A flexible storage solution that adjusts in height to accommodate tall or shorter items in most cabinets. The contemporary design and brilliant chrome finish present a polished look when you open your cabinets. Handy and sizable, the wire basket pulls out for easy access to the contents inside and can be made to be removable, if desired. This shelf works great in cabinets that are 18"W or larger. This is a great design. I ordered two and was amazed at the storage with just one. Highly recommend! Looks great now that I figured out how to assemble. Wouldn't spend that kind of money again when I have since found similar ones in stores for less. This cabinet organizer is sturdy and fits our needs to a T. The custom built cabinet was too big and could've used a pull out shelf, but was too much trouble to have done after it was installed. This cabinet organizer fits perfectly in a deep cabinet and was adjusted for our needs, with space on the side for other things. I live in a small old house in New England. Colonial houses have very little storage space. Life was much different then. This can be frustrating for us living now because we have lots of stuff! The clutter under the kitchen sink was crazy annoying. This awesome shelf turned the land of falling over spray bottles, soaps, sponges and boxes of garbage bags into a much better place. The pull out drawer makes everything much easier to access. These wire shelves are a cinch to put together. All of the parts were there. No tools required. Also, it looks great. I am a real Overstock customer. This is an honest review. I own many wire shelves, a wire cart and now this "under cabinet organizer" all purchased from Overstock. Great merchandise. Great prices. Highly recommend. I love this organizer! It fits perfectly in my powder room cabinet. I put extra toilet paper and hand towels in the pull out drawer, and cleaning products on the top. I also have a closed plastic container “first aid” box for my grand kids scrapes. Just perfect for me! Adds space and organization for the laundry closet. Was easy tp put together and is sturdy. Drawer glides easily in and out and I can keep some things that won't fit in the bathroom but is still in easy reach. Very happy with my purchase. Works well under the bathroom cabinet. This shelf came in handy to accommodate stuff from 2 bathrooms into one. Works great under my sink. Gave me a lot better storage area. Works like a charm! Excellent product. I love this shelf. First of all it was bigger than I expected an it fits right under my kitchen cabinet and Fast shipping as well. Love these, it's 2nd one I've purchased! Very sturdy, great for bath & kitchen. Goes together easily. These were great, very easy to put together and very well made. Pleased with the purchase. Organization of bathroom cabinets. Hopefully this will help! Looks good for under kitchen sink. One can never have enough practical storage.